If Hillary Clinton fails to be elected president, there is a strong chance that books about the 2016 campaign will note today as a major day in the crumbling of Clinton’s previously “inevitable” path to victory. 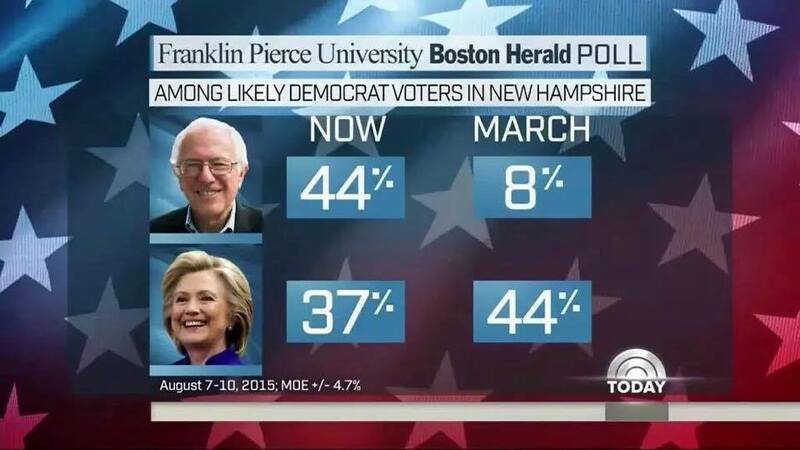 Prior to this week Sanders was behind but in a statistical tie with Clinton in New Hampshire. The latest poll shows Sanders with the lead. This represents tremendous momentum when compared with his eight percent support in March. National polls this early have virtually no predictive value in a nomination battle, and an early victory can have tremendous impact on subsequent states and the national polls. Polls can still change in either direction between now and February, and a victory in New Hampshire certainly is no guarantee of winning the nomination. What makes this election different from previous elections is the scandal surrounding the Clinton campaign, and the email scandal become much worse for her. Top secret emails were found on Clinton’s private server, contradicting her previous denials, and Clinton has agreed to surrender the server, now realizing that it would be subpoenaed if she refused this request from the Justice Department. From an ethical standpoint, this is not the worst aspect of the email scandal. Ethically she did worse in violating principles of transparency, in destroying evidence, and in receiving financial rewards from parties she provided favorable decisions to as Secretary of State. I do not believe Clinton intended to violate laws regarding classified information, but his appears to have been a consequence of her foolish decision to use a private server, and this is what places her at serious risk of criminal prosecution. Besides these cases, there have been two high profile prosecutions regarding improper handling of classified information, David Petraeus and, as I discussed last week, former Clinton national security adviser Sandy Berger. If the reports of classified information on Clinton’s private server are true, and if Clinton is treated like the others, she will be indicted. Possibly the “Clinton Rules” will apply here with others receiving the blame, and she will escape such a fate, but this would still seriously harm her in an election campaign. The Republicans might very well also destroy themselves and Clinton could still win, but nominating Clinton now looks like too great a risk for any political party to take. Those who deny the magnitude of this scandal are like those who tried to write off Watergate as a “two bit burglary“. Then there is the news reported by McClatchy News Service that two of the four classified e-mails discovered on her private server were “top secret” — the highest possible security classification. Clinton has previously said that she never sent or received any classified material via her e-mail account; “I am confident that I never sent or received any information that was classified at the time it was sent and received,” she said last month. There’s simply no way to see these latest development in the long-running e-mail story as anything but bad news for Clinton. The turning-over of her private server not only takes control of its contents out of her hands but also likely ensures this story will be in the news for far longer than she’d like. It’s safe to assume two things changed Clinton’s mind: political and legal pressure. First, the public’s trust and approval of the Democratic front-runner has plummeted amid revelations that she established an email system that violated federal policy, thwarted congressional oversight, and skirted the Freedom of Information Act. Second, facing sharp questions and rebuke of a federal judge, Clinton just this weekend declared “under penalty of perjury” that she has turned over to the government all of the emails that were federal records. The FBI is investigating the security of her email system, which she unequivocally declared to be ironclad in March. “There is no classified material,” she said. The untruth revealed, Clinton changed her story in July to claim that no email was specifically marked as classified. Not that it matters. Clinton wants Americans to ignore the fact that federal rules put the onus on government officials like the secretary of State to protect classified material, even when it’s not marked as such. Know this: Government officials have been convicted of mishandling unmarked classified material. And this: The fact is, any chain of events or excuses that led to the disclosure of these documents begins with Clinton’s decision to go rogue with government email. This is her fault, all of it. Including her no-win situation. If the FBI is able to recover deleted email from her server, it’s almost certain that more classified documents will be discovered (given what has already been found in the tiny sample size). That would raise more questions about her judgment. Furthermore, a thorough autopsy of the deleted email might lead to details about other embarrassing topics, such as Benghazi (a GOP fetish), or the intersection of Clinton Foundation donors and State Department business (“Follow the money,” a Democrat close to Clinton told me in March). Though this is pure speculation, her closest allies worry about what might be found. Sure, she might win. Just look at the weak spots in the GOP line. But why win this ugly? Why commit Americans to another four years of a politics and government they can’t trust? Why run a grind-it-out, 20th-century campaign amid the rise of purpose-driven millennials? Why not be an aspirational, transformational leader—the architect of a presidency that matches her potential. The polling results out of New Hampshire suggest that Americans might turn to Bernie Sanders, rather than Hillary Clinton, to be that aspirational, transformational leader. Update: Democrats are said to be in “near panic mode” with new talk about Biden or Gore running. Posted in Al Gore, Bernie Sanders, Hillary Clinton, Politics, Polls, Scandals. Tags: Al Gore, Bernie Sanders, Democrats, Hillary Clinton, Joe Biden, Scandals, Watergate. RSS feed for comments on this post.. TrackBack URL. "Those who deny the magnitude of this scandal are like those who tried to write off Watergate as a “two bit burglary“." Nixon won in 72 in an absolute landslide. He crushed McGovern. Which made the Watergate burglary and all the other unlawful doings of CREEP all the more idiotic. He sure looked like he would have won if he hadn’t pulled any of that. Put a fork in Hillary. She is done. Trust is a huge issue with voters. (notice that I did not say the American people). The people that do vote feel it is an obligation to elect leaders. Everyone else is just fodder. Feeling the Bern! Really? REALLY? A supposed liberal blog is going to act like Fox News and trumpet this false scandal? Why not just yell BENGHAZI while you're at it. To be clear: I am still undecided until I hear the Democratic candidates debate, but if you think you are promoting "liberal values" by smearing a Democratic candidate just to promote your own candidate, your "values" need a close re-examination. At least I'm proud to say that our blog has decided that we will not engage in Dem on Dem smear attacks. Critique and criticize based on policy issues and factual information, yes. But to use a Republican initiated witch hunt against a Democrat is a smear. All that does is aide and abet Karl Rove, Frank Luntz and other nefarious GOP spin doctors. Maybe you can learn something from the candidate you support: "I have a lot of respect for Hillary Clinton, she is somebody I've known for 25 years. I'm not going to be engaging in personal attacks on her. The American people want a serious debate about serious issues, not personal attacks." ~ Bernie Sanders on CNN. If you wish to be partisan hacks that is your business, but it is you who are acting like Fox if you ignore principles and cover politicians based upon party and ignore the facts. Politicians should be held to the same standards, regardless of party. This has nothing to do with Benghazi. That is just a way for Clinton-apologists to ignore that this is a very real scandal, with criticism coming from liberals and the mainstream media. Reporting factual information is not a smear, but your decision to ignore factual material because it is about a Democrat is dishonest, cowardly, and no better than what we see from Fox. This is not about promoting my “own candidate.” I will consider any Democrat who is ethical, but one which the facts show has been corrupt. This is hardly a Republican initiated witch hunt. The latest investigation discussed here is coming from the Justice Department in the Obama administration. Pretending this is just a Republican smear and ignoring the cold hard facts only makes it more likely we will wind up with a Republican president in 2017. Well, Jay, if you want to engage in Tea Party like tactics, that's your right, however, discussing this email situation, which shows a profound lack of judgment on Clinton's part and, a far as I'm concerned, disqualifies her for the presidency, is ridiculous. You're undecided? I don't think so. Me thinks thou doth protest too much and you're Clinton all the way. Jay: I have visited off and on this site for years. I do this to bring a little balance and perspective to my deeply held conservative/ibertarian beliefs. I almost always disagree with Ron on every issue but I believe in Ron's integrity to his beliefs. Ron tirelessly defends/answers attacks and questions about liberal values. He fearcely attacks Republicans and/or conservatives (sometimes I would say too passionately) and not with just banter but with sources and data. One of the big problems he has with Clinton is she is not consistantly liberal, she is just consistantly self serving. If you want to fight for a team name (Democrat) regardless of what that person believes or does, so be it. But this blog is Liberal values, not Democrat values, or Hillary wants power at all costs values. Thanks to Mike and Arlene for their defenses. One other strange line in Jay’s comment: “I am still undecided until I hear the Democratic candidates debate.” Neither Sanders nor Clinton is new to politics. Both have a long track record. We have plenty of information as to how the two differ quite dramatically, both ideologically and ethically. I could see someone who is not heavily into politics watching the debates to decide, but I would think that any blogger should have been paying enough attention to have an opinion as to which of these two they would support. Of course Jay is probably not really paying attention if he thinks that the very real scandals created by Clinton’s unethical behavior are like Benghazi or a Republican witch hunt.